Vilnius is the capital of Lithuania, a country in the Baltic region of Europe. Vilnius is known for its Old Town and beautiful baroque architecture. I had a great time exploring the city and I feel that Vilnius is an underrated destination! Here’s my guide to the top 10 things to do in Vilnius. 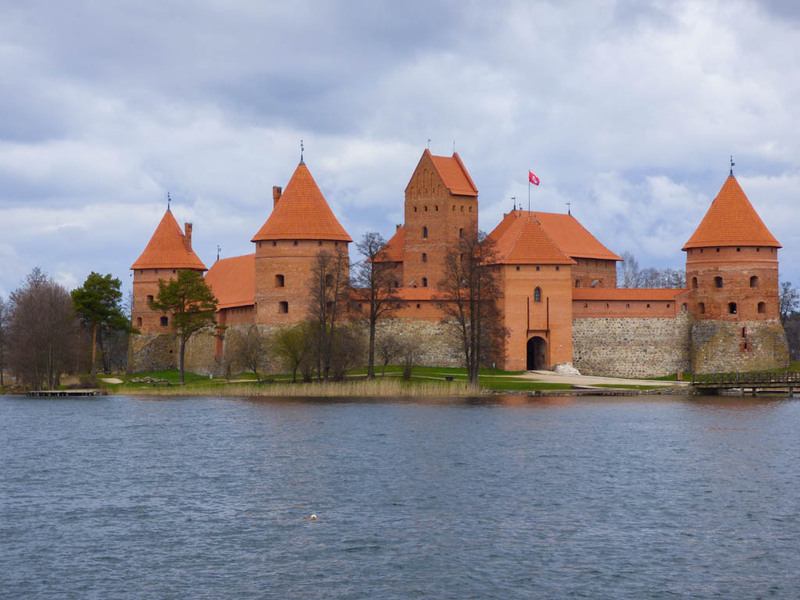 Trakai Castle is a magnificent red brick castle located on an island in the middle of a lake. It is about 30 minutes away from Vilnius. Originally constructed in the 14th century, it fell into disrepair after the wars with Muscovy in the 18th century. After World War II, it was reconstructed and is now a major tourist attraction. You can take a bus or train to Trakai from Vilnius. I wanted to learn more about Lithuania and the history of the castle, so I booked a tour through Viator with a company called Vilnius City Tour. The guide gave a lot of interesting facts during the bus ride and castle tour, and after the castle tour there was free time to eat lunch, walk around, and buy souvenirs. The Museum of Genocide Victims is an important place to visit in order to understand the history of Lithuania. In 1941, it became the Gestapo headquarters during the Nazi occupation of Lithuania. After the Nazis left in 1944, it was occupied by the Soviet Secret Police (also known as the KGB). In 1991, the KGB left Lithuania, and their former headquarters was turned into a museum. The museum contains exhibits about the Lithuanians’ resistance against the Soviet occupation on the two upper floors, while the prison cells and execution chambers are located in the basement. The museum is open 5 days a week (closed on Mondays and Tuesdays). The admission fee for adults is 4€. If you are a student or senior the fee is 1€. The 326m tall Television Tower dominates Vilnius’ skyline. While I was on my way to Trakai Castle, I noticed the tower looming above the much smaller buildings. It stood out so much that I knew I definitely wanted to visit it! So the next afternoon I did. The tower has a tragic history as on January 13, 1991, during the disintegration of the USSR, Soviet tanks surrounded the tower in an assault that killed 14 unarmed civilians. On the ground floor of the tower, there is a small exhibition about the events of January 13th. Outside the tower, there are crosses dedicated to the victims. It is free to visit the exhibition but you must pay to visit the observation deck. There is a revolving restaurant on the same level as the observation deck where you can have a meal and enjoy the view of Vilnius. Each rotation lasts 45 minutes. Vilnius TV Tower is open 7 days a week, from 10am to 10 or 11 pm. You can view ticket prices here. Located a short walk from Vilnius Cathedral, the Money Museum features exhibits about the history of money in Lithuania and all over the world. Entry is free (although the security guard jokingly told me I had to pay when I asked him if entry was free). It is closed on Sundays and Mondays. The museum features several interactive exhibits, such as the one where you can weigh yourself and see your weight in gold, silver, and platinum. There’s also a huge interactive screen where you can read facts about every country in the world, like currency and population. You can take a quiz after you finish viewing all the exhibits. If you answer all the questions correctly, you can print out a souvenir banknote with your photo on it! Located at the top of a hill, Gediminas’ Tower offers fantastic views of the Old Town. After dreaming of a wolf howling at the top of the hill, Gediminas (the founder of Vilnius) chose this spot to build a wooden castle in the early 1300s. Inside the tower there is a small museum which features models of castles as well as archaeological discoveries. The tower can be reached by taking a short funicular ride or climbing up the hill. The Church of St. Anne is a Gothic style church in Vilnius’ Old Town. With the exception of the Neo-Gothic bell tower, which was designed in the 19th century, the appearance of the church has stayed the same over five centuries! During his visit to Vilnius in 1812, Napoleon Bonaparte was so impressed by the church that he said he wanted to take it back to Paris in the palm of his hand. It certainly is one of the must-see attractions in Vilnius! Uzupis is a bohemian neighbourhood in Vilnius that declared itself a republic in 1997. It has its own flag, anthem and constitution. The constitution has interesting rules like: “Everyone has the right to love and take care of a cat,” and “A dog has the right to be a dog”. It is a popular district for artists, and many open-air art exhibitions are held in Uzupis. The Three Crosses are a monument on a hill in Kalnu Park. The hill has a great view of the Old Town. Legend has it that 7 Franciscian friars were beheaded on the hill in the 1300’s. During the Soviet Occupation in 1950, the Three Crosses were destroyed. The citizens of Vilnius wanted them to be restored, so in 1989 the Three Crosses were rebuilt. The crosses are a symbol of resistance to the occupation and one of the most famous landmarks in Vilnius. Cathedral Square is a popular place for locals to meet. At Christmastime, a large Christmas tree decorates the square. At the entrance to the square is Vilnius Cathedral, a Neoclassical style Catholic church with beautiful, pure white columns. From ground level, the Neoclassical facade makes it look more like a Roman temple. Next to the cathedral is a bell tower which used to be part of Vilnius’s defensive wall. It has been rebuilt several times throughout the centuries. With all the unique buildings and relaxing cafes, you can easily spend hours exploring the streets of Vilnius’s Old Town. It is even an UNESCO World Heritage Site! Vilnius looks like a great place to explore. The city has been on my bucket list forever. Thank you for sharing, your post really triggered me to start planning my trip to Vilnius. It’s not a place I knew much about, so I was excited to read your post and learn more about Vilnius 🙂 . My first key learning: even though there are a ton of churches in Vilnius, there’s a lot more to see, too ! My second one: the Museum of Genocide Victims; contrary to what the name might lead you to believe, this isn’t a museum about the Holocaust or World War II – it’s actually about the 50-year occupation of Lithuania by the Soviet Union and about how Lithuanians resisted. Thank you for sharing. I’m all about finding good viewpoints in a city so Gediminas’ Tower sounds like my kind of place! These photos are gorgeous, Lithuania is on my travel radar but I haven’t done any proper research into visiting – looks like I’ll have to do a little more digging! Same with me! I always look for a tower or hill where I can get a good view of the city. I’m going to Vilnius in a few weeks and Trakai Castle and the TV tower are definitely on my list. Thanks for sharing this useful rundown! Those castles, museums and churches look amazing! I love history and architecture, so that’s right up my alley! Yes, Vilnius has such interesting history and architecture! I love old medieval towns! What was your favorite site? I’d have loved to visit that castle!